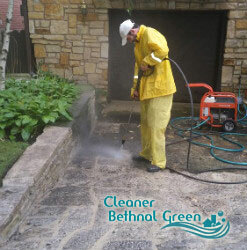 Are your patio and driveway in need of a professional cleaning? If they have gotten discoloured, stained, too dusty, or mouldy, you can feel free to call our company right away and hire our one-of-a-kind patio cleaning service. We assure you it is the best one in Bethnal Green E2 and we have what it takes to prove it to you. Give us a call right away and hire our efficient and unequalled patio cleaning service. We have equipped our cleaners with the latest fashion pressure washing machines, which help them work faster and more efficiently. They also use special cleaning products and degreasers. You can count on us for perfect results. Our experience has thought us that hot water is the right and most efficient and safe way to clean patios and driveways. We have perfected our cleaning methods and approaches and with our skilled cleaners, we guarantee you shinning and lively looking patio and driveway. To us it does not matter what they are made of, whether it is tarmac, concrete, paving slabs, re-constituted or natural stones, printed concrete, etc, our cleaners can clean them all. Trust us with your driveway and patio and hire our fantastic, unequalled and fairly priced, not to mention convenient patio cleaning service, for help. We promise you will be more than pleased with our results. 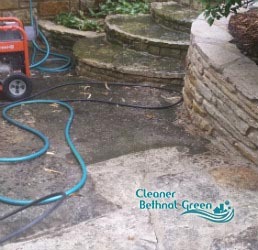 We will get your patio rid of mould, algae, dust, and your driveway, too, and from tyre marks as well. Please do not hesitate to call us right away. We always have a phone assistant ready to help you with additional information. Get help from the best cleaning services provider in Bethnal Green.